Home Maintenance & Repair RV tires: “safety factor” versus “reserve load” – What’s the difference? 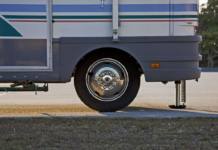 RV tires: “safety factor” versus “reserve load” – What’s the difference? While that sounds reasonable, it really only works when talking about pieces that fail from simply increasing the load placed on the component. Items like tires do not really have a “safety factor,” as tires generally do not fail from simply increasing the load too much. In a non-rolling situation, I would not be surprised if we could load tires to 200% or maybe even more than 300% of the load marked on the tire sidewall. However, as soon as you introduce rolling or time or operating temperature, the maximum load before failure is much closer to the max load molded on the tire sidewall. The exception to max speed is affected by temperature, time and load. With zero load many tires can probably handle 200+ mph but, again, for how long and at what temperature? Since tires are basically a structure made of “organic” components, time and temperature can have a significant impact on the maximum load capabilities of the tire. If we think of non-organic items like a steel girder or maybe even a stone block as used in the pyramid, we can see that time and normal atmospheric temperatures have essentially no impact on the long-term maximum strength. The exception would be if we were to allow steel to rust or stone to be exposed to water and freeze/thaw cycles. Tire engineers prefer to use the term “reserve load” when talking about the load capacity of a tire. Here we would find the tire engineer definition as the difference between the tire’s maximum capacity when inflated to the stated level for the specific application (the inflation on the tire placard) and the actual load to be placed on the tire. When you compare the reserve load percentage of the different groups you can easily see the different level of reserve load. What should the reserve load be for your RV? Currently, RVIA considers 10% to be the minimum reserve load. However, the few actual tire engineers that are posting on RV forums are suggesting a MINIMUM reserve load of 15%, with more being desirable. I know that on my Class-C I am running closer to 20% reserve load based on actual “four corner” weights, i.e., individual tire position scale readings. What is your actual reserve load? Previous articleThe upcoming Blood Moon – a rare treat! I am at 38% with my PrimeTime 325RST. Always informative, Roger, thanks! Off topic, but not by much; any data on how big a risk to park motorhome on asphalt while in storage? That’s what I have to do, and I’d like to know if there are any objective data or studies that can quantify this risk? A lot of trucks and cars park on asphalt for extended periods. I don’t want to diminish the life of my $800 ea motorhome tires.